Provides a comfy grip to hold, and prevents any irritation between your hand and the band. The Velcro ends make it easy to attach or remove. 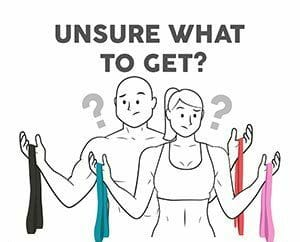 To prevent irritation, use the straps anywhere the band makes contact with your body. Works well not only for your hands, but also around your ankles, shoulders and behind your neck. Or, use these like a zip-tie and combine multiple bands by bunching them together tightly to increase resistance. one (1) Adjustable Hand Strap. What is the widest band that will fit in this strap? This product fits up to the Heavy (black) band (https://www.rubberbanditz.com/heavy-resistance-band).